This app uses the touchpad only. * To use a button, gaze at it and then tap touchpad. * To aim the telescope, slide finger on touchpad. * To dismiss UI elements, use the Back button. Overall, the user may either freely explore and learn about the night sky, and/or choose to attempt challenges called "tasks" which are intelligently served to the user a few at a time. The user can interact with the telescope by calling up the Scope to help with a rough aim, and then calling up the Telescope viewer to get a deep look at the target area. At all times, the touchpad can be used to refine the aim. The user may also call up a UI, where the user can fiddle with tasks, view hints, adjust settings, and ponder the "unlockables" that will be available in the full version of this app. If the user has a swivel chair, this app takes full advantage of that to reduce simsickness to a minimum by letting the user be fully responsible for their own rotation. If the user does not have a swivel chair (or opts not to swivel), this app attempts to reduce "rotation sickness" by dimming the night sky, thereby reducing the size/intensity of the visual field that is rotating. Viewing through a telescope without neck discomfort, but in a way that is still reminiscent of a real telescope. Ability to use headtracking to easily and naturally compare what's in the night sky with the view through the telescope. Ability to tap into lots of situational and supplemental information about the stars by looking left or right of the view through the telescope. Telescopic is a combination of a telescope simulator + observatory + planetarium that aims to make learning your way around the night sky fun. This entry can also be found at ChallengePost here. I'm primarily creating this app for myself, but if others eventually benefit from it that would be pretty awesome too. As profoundly amazing as the night sky is, it's overwhelming for me. I've used planetarium apps to find my way around, read night sky reports, etc. But, after all this time, I'm still only truly familiar with Orion and the Big Dipper. Because I don't get to see the stars every night, I forget most of what I learn. This app will hopefully change that by combining several motivational and memorization techniques to keep me engaged and help me retain more of what I learn. In Telescopic, you start off in the middle of nowhere, sitting on a chair that has a big telescope attached to it, with a great big clear view of the sparkling heavens. In VR, this means it's just you and the telescope with no distractions. Rather than actually peeking into scopes and eyepieces, you'll be staying in your chair to interact with the telescope, and it's where you can manage your goals, achievements, unlockables, and fiddle with various options. The Gear VR's touchpad is used to aim the telescope, and interact with UI elements. The player can switch between various modes: UI, scope, telescope, and sky rotation. The scope mode is used to generally aim the telescope, and the telescope mode is used to get a deep view of the target. Looking up at the sky from your chair, you will not see helpful constellations drawn onto the sky, no labels, no celestial compass. But, when you look into the telescope, you'll potentially see far more than any real backyard telescope can reveal. This will be the first time I've openly shared previews of an in-development VR experience. This Jam is also somewhat unfortunate timing for me as my time is really scarce right now, so I'm hoping to get as far as I can with this. I'll be posting screenshots and stuff along the way. Soundtrack and high quality deep sky imagery isn't ready yet so I'll save that for next time. Slightly updated platform model. 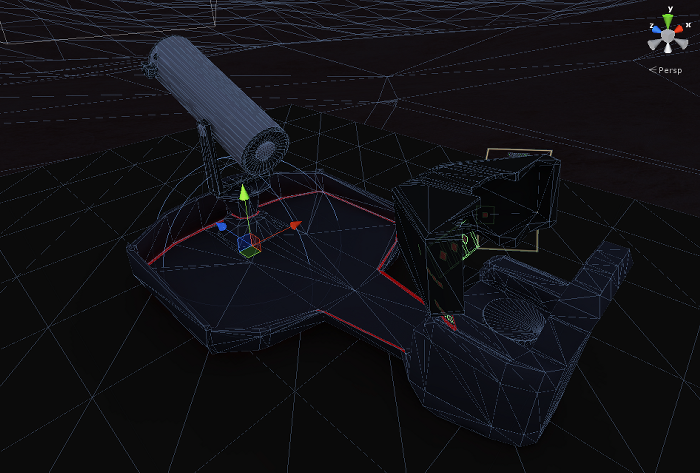 Still a long way to go, and the telescope itself is still just placeholder cylinders and such. The new telescope viewer. Rather than killing one's neck to look through the actual eyepieces, I'm taking a different approach. This shows using the new scope mode without having to leave the chair. No matter what you're doing, the touchpad can always be used to aim the telescope. And this shows the new telescope mode. It's a big "visor" (shown in #2 above) positioned in front of the player designed for comfortable viewing, and it provides a place to supplement the view with additional information and UI. Tapping the touchpad reveals information about what you're looking at. Pausing to look at a point of interest will mimic a long exposure and let you see more than what a telescope would reveal in realtime. While in telescope mode, the player can still see the mode buttons below, and the sky above. 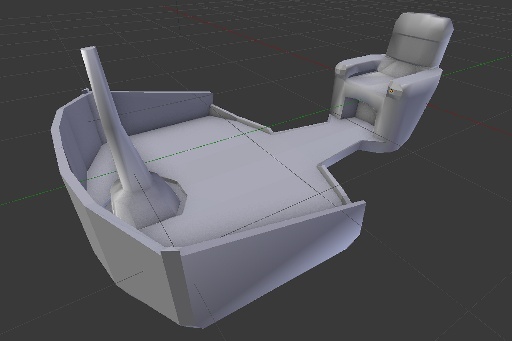 The above screenshot shows a model of the chair and the telescope platform. The vertical stalk you see there is what the telescope attaches to. The entire platform will swivel around the telescope, making this a simple conversion to work with positionally-tracked headsets in the future (as you'll only need to get up and walk straight forward at all times). This shows basic aiming for the telescope (and thus the platform). As you get closer to the telescope, the aiming sensitivity goes from wild swings to fine-tuning. 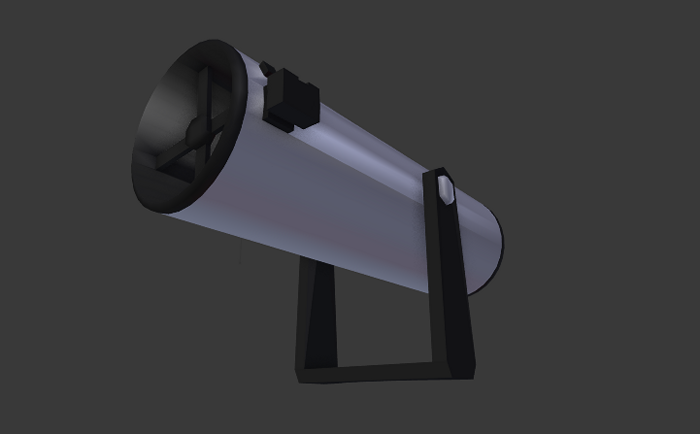 The telescope itself is still placeholder-ish with basic geometric primitives. Using the scope. This is tricky to line up the right eye to the scope at all times yet still give the player the freedom to look around, since the scope itself moves with the telescope when you aim it. At some point, I plan to make it an option to make the scope be on the left vs right side of the telescope. Good stuff, and I wish you the best of luck. Best of luck for this project, I'm eager to try it! I said "Ok", but he just kept looking at me and and said "No, I mean. That... was... amazing". Every time he visits he runs Titans, and I can't wait to show him something new this summer. Whoa, it's the V^Bert guy! Do you have your own entry for this Jam? Thanks for the story about your father-in-law, I appreciate that. I can't wait to try it either Drash. I have shown many people Titan's of Space and they're always blown away. My brother was so touched, he shed a single tear, took it off and said: "that was beautiful." Many people I show Titan's of Space say that it should be replacing the planetariums. Seriously, I've heard it from so many people. Great job on this project so far, can't wait! I'll buy Mars is a real place on the weekend, hopefully that buys you a pint of something. I'd love to see VR become a learning tool. This will be a great app for people like me who live in a big city (in cloudy UK) and rarely get to see the night sky without all the light pollution. Maybe you can even include objects like the ISS or get support from NASA to produce a full version post jam. Yeah, I'm making something. Right now all I got to show for is a tree, but things will ease up after this weekend and I'll hopefully be able to post some gameplay videos that will prepare people for all the jumping they will have to do. can you mention what you plan to do with the walking from the couch to the telescope? Why not have the player be a bit closer to start? Great question. 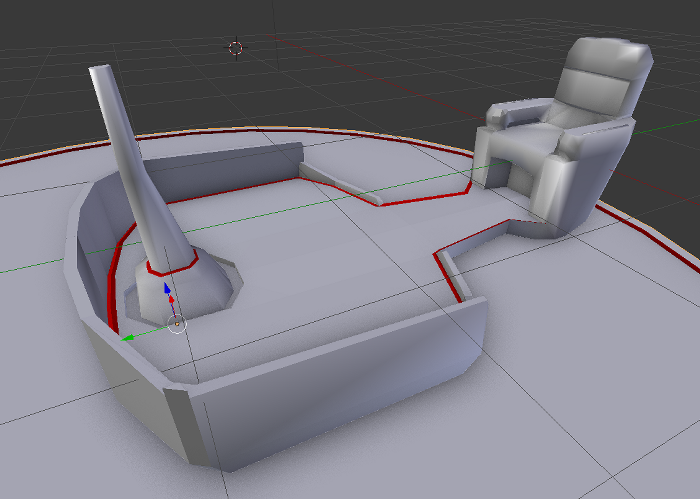 After some additional planning and experiments, I've decided that players will be too fatigued to constantly be going between the chair and the telescope (which I was going to do via touchpad tapping), so now I've changed it so that everything can be done from the comfort of the seat. For VR platforms with positional tracking, I'm going to still allow the telescope to be used naturally for those that want to get up and enjoy a "telescope simulator", but that will be totally optional. The telescope will be fitted with some fancy cameras that pipe the image over to the chair where it can be comfortably viewed. Now I can avoid depending on the way the Mobile SDK's neck model is implemented under the hood in order to line up the player's eyes with the scope/eyepiece while still allowing the player to freely look around. I can also avoid requiring the player to look so far down or up in order to peer through the scope or eyepiece for extreme telescope angles. At the moment I'm working on efficiently loading up data for 15000+ stars at startup, efficiently retrieving this data in realtime depending on where the telescope is aimed, and ensuring that I can arbitrarily rotate the night sky and still see the same stars in the skybox, the scope, and in the telescope itself. That last bit is really important because, depending on where players live (and the time of the year), players may be used to seeing a certain portion of the night sky which will help with learning their way around and appreciating what they see when they step outside at night. It will also make it easy to flip things over and see the stars on the other side of the planet that they don't normally see. More screenshots coming in a couple of days. I've just updated the first post with the Milestone 2 update, but I'm including the images here in this post as well. I've gotten things running smoothly at 60 FPS now, and mostly finished the core mechanic of simply looking around with scope and telescope views. Will be taking a break for a few days, but up next is to finish up the first pass at the goals/tasks/quests/missions system, which will be really important in giving the player some purpose as they explore the sky above. To do this, I'm drawing inspiration from the spaced-repetition memorization system, as well as trying to include some of the compelling parts of today's goal-oriented casual games. Might not be totally reliable, but it would be cool if you optionally used the phone compass and GPS to show the actual night sky as it is from the user's location. So in theory you could go out at night, take the Gear off and see the same stars in the same positions with your naked eye, or the passthrough camera. I think it would also generally be more comfortable to have the telescope move around the player rather than the player orbiting around the telescope, for better standing/swivel chair experience with no forced rotation. Great suggestions owenwp! I think the auto-location thing is going to have to come post-Jam, but you're right that would be very cool to line up the real with the virtual sky. I personally felt that orbiting around the telescope in this way felt "exciting", but you have a point here. If it's exciting for me, it might be uncomfortable for others. Going to have this be an option. Well I don't want you to have a reason to stop using the real thing, but wow that thing is 40 lbs! I read that some people build carts for these telescopes to make it easier to wheel it outside on a whim. And shot of the Unity scene. Very dark here, but ample visibility and easy on the eyes in VR. First post updated for Milestone 3. The soundtrack + high-quality deep sky imagery isn't ready yet so I'll save that for next time. very cool, lots of interesting aspects to this one. really looking forward to explore in this (and maybe learn a thing or two dozens). This is looking awesome Drash. Can't wait to try the finished result! Just wondering if you have to apply your black smear correction stuff here given the darkness of your project, or did you find a way to deal with that better for GearVR? I have finally freed myself up enough to get some development time on my GearVR, and I'm running into black smear already. About to try your DK2 solution, but was worried about mobile performance impact. edit: I sort of answered my own question about black smear. My solution is to just to post process my baked textures in photoshop with the levels tool to change min level to around 5-10, and fix camera clear color to be exactly the same dark gray. Works nicely and kills the smear. Still interested in what your solution might be in this space. Have you tried experimenting with something like night-mode from Stellarium? It turns everything red, so your eyes stay dark adjusted. I wonder if it would work with a screen that close to your eyes. That way you could use an app like this to figure out how to point your telescope, while actually using your telescope at night. That would be awesome. Looking fantastic! Love the concept! And the lens effect you have looks great! Artist at Dual Reality Games working on PhaseShift!! VOTE NOW!! That's pretty much what I am doing as well, just baking in the minimum color levels in all the art. I agree, this works great! Well, not turning *everything* red, but that is the precise reason a lot of my color scheme is red. I was originally planning on using a green color scheme (hence the ugly old logo at the top of the first post), but changed my mind on that. After the Jam, I'll have to think about a full-red option. That would be pretty wild actually. Dev Update: Marching toward the final Jam deadline, things are going well. I am feeling good about most of it, but I think I will run out of time for certain things. I'm actually fine with this, because I've decided I'll be releasing the Jam build as a "limited demo" which means it is a free demo with a limited number of goals available, background info for a limited number of stars, a limited number of expansive deep sky imagery, and the unlockables will have to come at a later date. The Jam build (not available yet) should be enough to get a solid taste of what the full version of the app can offer. In other news, this app has original music and audio composed by Jon Hillman, the talented musician that made the wonderful music for the Solar System portion of Titans of Space! The Milestone 4 submission page is here at ChallengePost. Good luck to everyone on getting to the finals. I can tell the competition is extremely stiff. I can't think of a better way for Oculus to spend $1M, because everyone wins! Just tried it and it's pretty awesome. Great educative app again. Solar system was not enough for you you had to add 150.000 stars? I actually sat outside and I was convinced by the lighting you made for the scene. It was great spoting orion and learn more about it. One thing you might want to look into later on: I had problem focusing on the star at full magnification. My eyes would sometime cross to not double the star. Then again my eyes are pretty tired from the last night's of jamming (also I have a small ipd around 60mm). I will definitively get it when it's available on the gear! Thanks for the kind words and feedback ludotex. I'm massively interested in what you're saying here because I made a rather odd decision to have those stars in telescope mode sitting 50 meters away from the player rather than way off in the distance. Going to have to think about the math behind this... unless anyone else has any ideas? Ok i have tried again. And i can focus if i really make an effort with my tired eyes. I think one problem might be the grey circle that represent the lens of the telescope. It has a slight grey ramp on it. And this object is closer than the stars 50m away. I think my eyes have trouble focus because they are trying to focus on the grey banding as well. Maybe if it was pure grey or black and not have this ramp, it would be easier for me. Does it make sense? I really appreciate that you went back to figure out what was going on! Good find. Those ultra subtle gradients don't play well in the Gear VR even with uncompressed textures, so I'll rework that for the next update. I agree with ludotex about the lens being distracting, but it's a very small issue in an otherwise fantastic project.